I LOVE LOVE LOVE to infinity…Lamb & Goat Meat. I do not understand the fascination with beef when there is such flavor and sweetness and succulence in Lamb meat. I mean, I have met numerous people who have never tried lamb in their entire lifetime and are so pleasantly surprised to have found it finally! So seriously, if you haven’t tried Lamb or Goat Meat before. You must do it. Its simply divine. If you compare Chalk and Spice, Beef would be the Chalk – bland meat that only tastes as much as flavor you give to it and Lamb would be the meat with its distinct subtly sweet and juicy flavor which stands out even when you deliver insulting amounts of spice. Now let me give you my tried and tested recipe for a Slow Roasted Boneless Leg of Lamb. In my family, we like our meat well done with no blood showing, so this recipe adheres to that method of cooking. Once you have tried it, trust me, you will want to run to your nearest Randalls/Safeway and make again and again and again….Amen! Prep your lamb meat at least 24 hours ahead to marinate for the best flavor. Since almost 2 kilos of meat is roasting for a long time, you need time to your advantage to gain the most flavor. Prepare the lamb in a Ziploc bag. In a small processor, throw in the rosemary leaves, mint leaves, garlic cloves, lemon zest and juice and olive oil and blitz away until it forms a grainy paste. Rub all over the meat generously – over and under and the sides. Now, take a sharp long thin knife and stab the meat as many times needed to get the marinade into the meat. Rub the marinade over the lamb again and seal the bag and refrigerate until next day. Place the meat on a large roasting pan. Repeat rubbing marinade all over. Now season the lamb meat with salt and pepper. Never salt your meat earlier as you don’t want the meat ending up dry. Salt leeches the precious meat juices out during the marinading time. 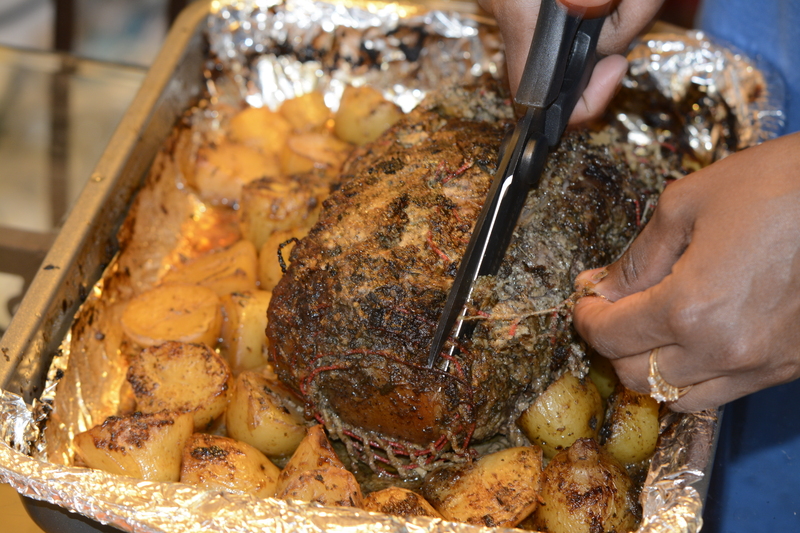 Cut about 4 tbsp of butter into slivers and place under the net of the lamb all over. The browned butter over the roasted lamb takes the meat to a heavenly level! Place the meat in the middle rack of your oven and roast for 20 minutes at 400° F – uncovered. Now turn down the temperature to 300° F and pour in 1 cup of the vegetable broth around and over the meat and cover the pan with foil and roast for 1 hour. Create slits in the foil to allow steam to pass through. Have a look after the hour passes and pour the juices that have dripped over the meat and baste the meat in all those glorious juices and continue roasting for another hour – uncovered this time. Repeat Step 7 again and roast for another 30 minutes to 1 hours until the internal temperature of the meat reads at least 175° F at the thickest dimension of the lamb meat. Once done, remove the meat from the oven and cover with foil and let it rest for 30 minutes. This step is very important to bring the juiciness to the meat before carving. Now remove the netting and carve and serve with the delicious dripping with any carbohydrates of your choice. 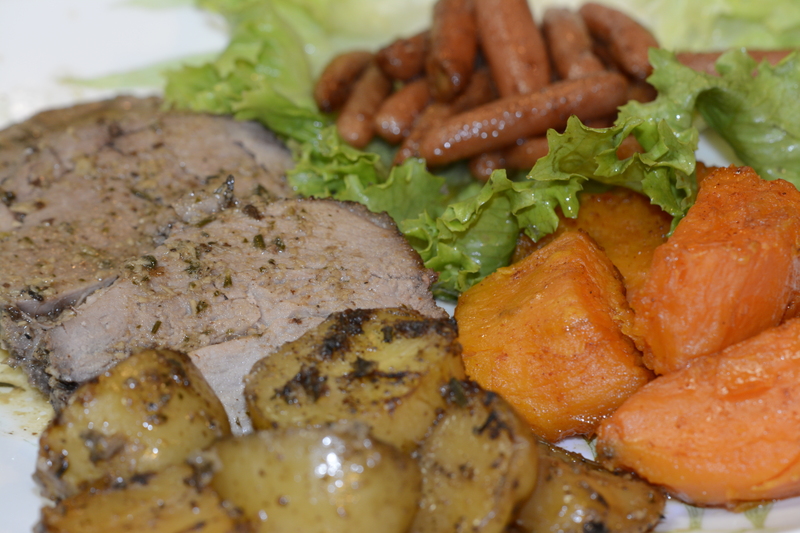 I made some heavenly glorious burnished maple roasted sweet potatoes and baby carrots and yellow baby honey gold potatoes to go with lamb and an improvised version of Coeur à la crème with fresh strawberry sauce for dessert. Once you get a bite of the succulent juicy lamb meat, you will totally forget why you spend almost 3 hours in the kitchen roasting! At least I did. As a side note, I would highly recommend to invest in a good oven and meat thermometer to really get your roasting perfect every time. Here is to enjoying many more grand meals with Lamb!